yes i went to the yarn sale. how could I resist? 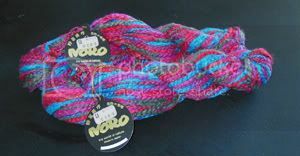 tasty yarn goodness? It was amusing upon approaching the yarn store, there were several husbands waiting bored outside the yarn shop. The LYS itself was crazy crowded with many bins of sale yarns and bustling people carrying boxes and bags of yarn. The sale yarns were 30% off, and on top of that, I drew a chocolate from the grab bag that gave me another 30% off of my entire purchase (Yay!). I picked up these because I liked the color and softness ALOT. 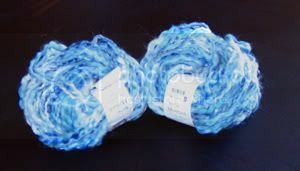 It's a crystal palace yarn called Musique, with tons of different shades of blue running through it. 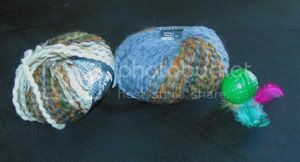 It wasn't in the sale bin, but I had to get away from all the crowding so I diverted myself to the normal priced yarns. Okay so I was going through my yarn bag this morning, and I found one of Skye's cat toys. I think it ended up in there from the "fight" we had at a & p's. It's in the next few photos for amusement. Asha was on the table though, and after I took these photos, she ran off batting it. I'm not sure where it went, but I'll find it and return it with soup spoons. 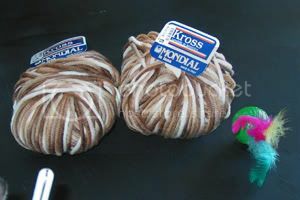 This is mondial kross 100% merino wool yarn. It's soooooooooooo soft and silky feeling! It's a superwash wool too, meaning it won't felt, and so it can be machine washed.